No one is saying that we ought not be inquisitive about how our world ticks and what hurts its natural processes . . . but where is the solid science to back it up? Would you subject yourself to a highly invasive medical procedure on the premise that you might have a disease that may, or may not exist, based on exactly one visit to said physician? No, you’d likely tell the doctor to take a hike while you go and get a second opinion. So, why should we subject our entire economy and our very lives to something that we’ve only been “studying” seriously for the past few decades; something that has been studied on the auspices of politicians who have figured out how to best use this to their advantage; something that reality shows us simply isn’t happening to the extent we’re all supposed to believe it is? 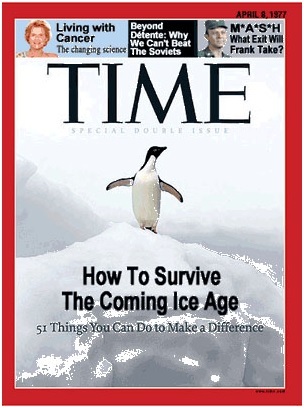 Incidentally, the very same people who are now telling us to fear the heat are the same people who just over 30 years ago were telling us that we were headed for another ice age. Recall this Time Magazine cover? As for the impact that his policies have and will continue to have, I certainly won’t disagree with Lynch’s assessment of the president. They certainly will have an impact, but not in the way Lynch believes. For indeed, these are life-changing, society-altering policies which are built on a foundation of theories, inadequate data, doctored data, and mega-politics. To be certain, just as we care for our homes, our possessions, and our families, we need to care for the world we have. Logic tells us we can pick up our trash and make sure our plants aren’t spilling sludge into the waterways without actually HURTING our world and our population in the way that many of the president’s “green” policies have. See here and here for further reading to that end. We are to care for what we have in a way that faces reality, and not based on a largely theoretical, subjective, and highly secretive worldview that coincidentally funnels an awful lot of money and opinion in one direction or another. Meanwhile, we still need the same energy sources as before the President came to office. Because the president won’t allow us to drill for our own (but seems to be fine with Brazil’s doing it), we remain dependent on foreign sources for oil (and thus lining the pockets of those who hate us). I’m all for the latest, greatest, most cost-effective, innovative solutions (whatever they may be, as long as they work well and work safely), but the fact of the matter remains that viable (cost-effective, reliable, safe) non-oil modes of transportation simply do not exist, yet the president has made it his personal mission to ensure the immediate reduction in fossil fuel use. As a result, we’re still driving our cars . . . but at a much, much higher price. Sneak Preview of Day 9: Land of the Free, Because of the Brave . . . but so what?